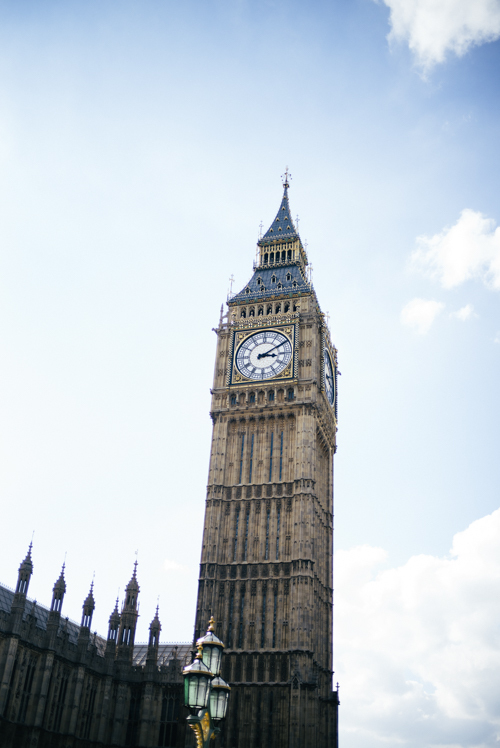 Though our trip to London was brief, we made sure to make the most of the free time we did have, which included many of the touristy things that we had done before but continue to love doing. On this day, we woke up early and walked to Covent Garden from our hotel, stopping for some happy snaps and coffee along the way. I wore a simple combination of jeans, a white cashmere sweater and my classic trench coat, but added a pop with these Stuart Weitzman Gilligan Flats in red. I receive a lot of emails from readers asking questions about what to pack for upcoming trips, seeking looks that are practical but still cute and stylish (you’ll have the photos & memories forever!). For a fall trip, I recommend a version of this combination. Each piece can be styled in so many different ways, making the most of the limited space in your luggage. We spent a good part of our morning at the Burberry Headquarters, which was conveniently located within walking distance from Westminster, Big Ben and the London Eye. We had to visit Charles Pétillon’s first public exhibit in Covent Garden, which is now gone, but had 100,000 balloons filling the entire market building. They looked like little clouds floating, a dreamy surprise for those who weren’t expecting it! It’s a part of his “Invasions” series of filling abandoned spaces with white balloons, each representing a metaphor for something unique. I try to keep my style as classic as possible, especially when splurging on more expensive items, to ensure that they’ll be pieces I’m still wearing 15+ years from now. I also believe in the power of a good accessory and by accessory, I mean shoes! Stuart Weitzman never fails to bring new life to a classic staple – case in point, these Gilligan red flats. They’re comfortable enough to walk around in all day and even transition into an evening look with a little black dress. Thank you to Stuart Weitzman for sponsoring this post. You look so cute in that trench & those red color shoes & bag. Beautiful photos !!! I love this Outfit!! It is so simple and so classic but so beautiful! And I am a huuudge fan of the color read!! You just put something red on and you fell inmediatly better and happy! Adorable casual look. Love the cute red flats. The flats look so cute. Beautiful! This outfit is so classic and sophisticated! Perfect outfit for London. Love your Celine nano! Daytime elegance! This is such a great outfit! I like your shoes and trench very much. Such a lovely outfit with great classic pieces that everyone should have in their closet! I haven’t been to London in a couple years and these beautiful pictures are making me question why. Stunning! I love seeing you explore my home town! The shoes are gorgeous. This is so classy and pretty! Love your purse and the trench! The trench is such an essential fall piece! The shoes are so cute ! you look gorgeous, love the outfit, especially the cute shoes! Your bag and shoes are beautiful. Perfect look. Red looks perfect with a neutral colored item like the classic trench you wore, love this combination! Those shoes are adorable!! They remind me of ballet slippers. I think you’ve completely nailed the comfy & chic look! I adore this outfit! It’s simple, chic, and sophisticated! I love this classic look. There is truly nothing better than a trench coat! Love this trench coat and shoes – so pretty! so cute! I have those flats and they are the best! This entire outfit is gorgeous!! I love the red flats with the neutral trench coat! Love the shoes. I have been seeing many versions of these every where. Love it! Gorgeous pictures of you in London. What great weather you had. I am so obsessed with your Burberry Trench, such a perfectly classic item for a London Trip! I love red, so I love these flats. But I also love them because of the lace up look! Gorgeous pop of colour! love a classic look! Those shoes are great and the trench is gorgeous! Cute flats! I love the lace up look! I love the neutrals with the pops of red! Those lace-up flats are perfection! OMG I have those same shoes in black and have thought a lot about getting the red ones. Now that I see them on you with this outfit I want them even more. I love how comfortable they are as well. I may need to break down and get them after seeing your post. You look amazing! Have a great weekend. Adore these!! Love a pop of colour to any outfit! The bag and shoes are a perfect match! What a nice classic look! Love the bright bag and flats!Have a great weekend! Those flats are perfect! I’m obsessed with lace up flats! Swooning of that Burberry trench! Absolute perfection. Loving this classic clean look with pops of color! I am dying over those gorgeous lace-up flats! Your outfit is as beautiful as always and London looks amazing too! These shoes are so good! Love the pop of red with a casual outfit! Oh my dear! I love this so much!! You fit right in in London. Love this classic look with the pop of red. Great, casual yet chic look to walk around London! Those shoes are stunning! I love what the pop of red adds to your outfit! I love flats! For the longest time I was looking to splurge on the perfect flat that I could wear on trips, and around town. I went to my nearest Stuart Weitzman location to try on the exact pair your wearing! I thought the red would be so fun, and the lace-up is so in right now. Unfortunately at 20 years old I have bunions like an old lady, so I actually found them veryyyyy uncomfortable. I was totally bummed, but I went looking for more inspiration from my fav bloggers, and actually saw you in your Chanel flats – and bought them! Shopping can be crazy, and I’m glad they’re so comfy for you! Just beautiful. I love the pop of red in this look. Comfortable and stylish for day of walking and exploring that wonderful city. love these darling red shoes !!! I adore those shoes! Very cute! Those flats are gorgeous! I love the lace up detailing. I would have loved to see the exhibit at Covent Garden. I remember seeing so many Instagram pictures of the balloons. It looks magical! We love this look so much! It’s simple yet fun with the pops of red. I love those red shoes! They’re so gorgeous! When you and Thomas shoot in the afternoon does he use a filter? Even when I change my settings around I feel like the pictures are way too overexposed, or the coloring is just totally off. 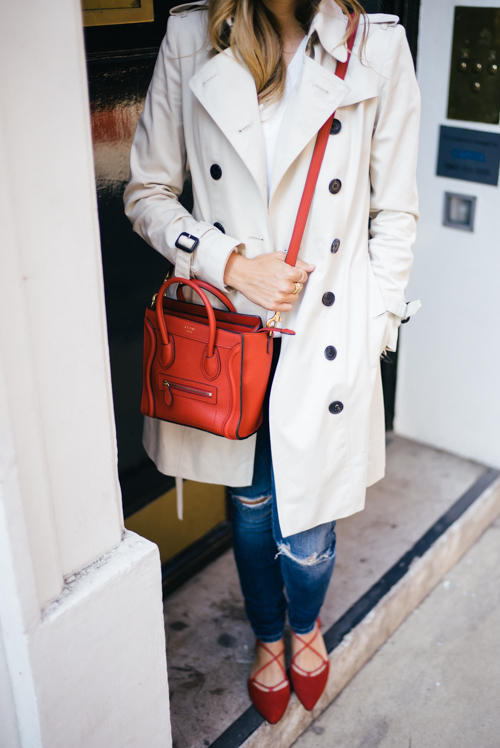 Loving the pops of red against the classic trench, denim and white tee! Julia, you tagged this as San Fran – but you’re in London. FYI. I have a similar pair in black, but I love how the red really pops against this neutral outfit! Love that your shoes and purse match! Those shoes are gorgeous, drooling!! Those flats make this outfit fun and give it a bold pop. Everything your wearing is classic, and the flats give the look style and character. Love Stuart Weitzmans! I have been wanting some lace up flats and these are just stunning. I love this outfit! Thanks for the inspiration! The best flats right now!! Super cute casual look for anywhere, and especially London! Love it all!! So pretty! Love London pics! You list your location as San Francisco…in case you want to fix it to London. This look is an essence of London casual style. I love the pops of red. It totally spices up a simple outfit! This is such a lovely outfit and I am just in love with your shoes! They complement the outfit so well! One of my favorite looks that you’ve ever featured on the blog. So timeless! Love, love, love this whole look! Especially the shoes, they are gorgeous!! Love it so much your classic style like always! And we totally agree with you. I seriously love your look! Those shoes are incredible- it looks like you had a great time in London! Truly the perfect casual look, with the functionality of walking around all day. Looks like a fun trip, I especially like the photo of the balloons. Love the shoes-agree, classic accessories that last forever are a must. Nothing like a classic trench, especially Burberry. Classy & elegant! Love this classic look! Those flats are all kinds of fabulous! I’m seriously loving these flats. All the other flats I’ve seen in a similar style to these make feet look a little funny shaped, but these definitely don’t! Beautiful photos! The light! London somehow inspires us to wear trench coats :) Burberry is always a good idea. The longer I’ve got my coat the better it looks in my opinion- it’s always our most trusted favourite pieces that make us look and feel fabulous. Super cute with the pop of red! Perfect flats for a day exploring! This is the perfect travel outfit combo :) I’d love to go to London one day! Great outfit for traveling – so agree with you! I love those shoes and that trench as well! This trench looks lovely on you and I love that you added red flats. Such a pretty outfit! I love this look! The colours are so fresh & perfect for Fall! I love that Burberry trench! I don’t normally see them in that color but I love it. The red/orange-ish accessories really make the trench pop. Great outfit! Those shoes are so cute and I love the shade of red! Hi Julia, I love your blog. I found this post on Pinterest. Can you please tell me what watch you are wearing in this shoot? It is so timeless and elegant. Thank you! Thanks for the Nordstrom sale finds Julia! Can you do a men’s version please? You look beautiful! I love the pop of red! I have never been to London before and it looks amazing!